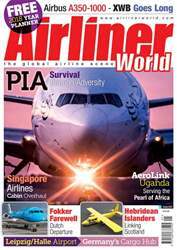 This will, for many of you, be the last edition of Airliner World before the year-end so it’s a good opportunity to reflect on what has been a remarkable 12 months for the industry. Many observers speculated the breathless 2016 would be a hard act to follow, but the Paris Air Show proved this certainly wasn’t the case. Manufacturers racked up orders for 934 commercial aircraft totalling $150bn over the four-day event, roughly equalling the previous show at Le Bourget in 2015 and trumping last year’s Farnborough.